The writers of The Torah’s Goal? (TTG) would have us believe that the Jewish way of life, as reflected in the observance of the mitzvot of Torah, became obsolete and purely optional after the New Covenant was inaugurated, that is, with the death, resurrection and ascension of Yeshua the Messiah. Further, they deny the legitimacy of the ways in which that pattern of obedience was shaped and mediated to Israel by the discussions of the rabbis. In other words, they reject the authority of the normative patterns of Jewish custom. In our previous posting, we demonstrated how such a construal is hard to square with Yeshua’s teachings in Matthew 23. This time and next we will demonstrate how, after the inauguration of the New Covenant, the apostles gave evidence that they viewed the mandates of Torah and the traditionally received patterns for living it out to still be the norm for Jews. Let’s start with Peter and the vision on Simon the Tanner’s rooftop. You will remember that Cornelius the Roman centurion had recently had a vision of an angel who told him to send to this house and have Simon Peter come to present the message of Yeshua to himself and his family. While Cornelius’ representatives are on the way to summon him, Peter goes up on the rooftop to pray. Many err in seeing here an abrogation of kashrut, Jewish patterns of eating. Before we get to that question, first note that Peter says “I have never eaten anything that is common or unclean.” This incident is taking place from seven to ten years after the resurrection and ascension of Yeshua. Remember that, after the resurrection, Yeshua spent 40 days with his disciples teaching them about the Kingdom of God. He ate with them, and all of these disciples ate in Yeshua’s presence during these forty days. If Yeshua had abrogated the Torah laws due to the inauguration of the New Covenant, it is rational to expect that he would have told them! But let’s leave that aside, because it is an argument from silence. More to the point is that Peter’s life speaks loudly here: some seven to ten years after the resurrection, and he is still strictly kosher! Now, does this vision abrogate kashrut? Not according to Peter! Peter receives Cornelius’ messengers, who stay with him overnight, and then goes with them to meet with Cornelius and his household. The trip takes one and a half days, so Peter arrives at Cornelius’ house the third day after his having his vision. And during that time, he apparently was trying to figure out just what is going on here! When he arrives at the house, he says this: “You yourselves know how unlawful it is for a Jew to associate with or to visit anyone of another nation, but God has shown me that I should not call any person common or unclean (Acts 10:28 ESV). When did God show that to him? In the rooftop vision! The vision was not about food! It was about people! What about Paul? Surely the Apostle to the Gentiles knew that with the inauguration of the New Covenant, the mitzvot of Torah were no longer obligatory for Jews, and surely not rabbinic customs! This contention is impossible to prove from the record. From various lines of evidence, let us select two, one from Paul’s speech, and the other from his conduct. We will see that Paul did not view Torah and tradition as defunct for Jews in the New Covenant. In the very last chapter of the Book of Acts, Paul arrives in Rome, where he is to appeal his case before Caesar, and eventually lose his life. His first priority on arriving there is that he wishes to talk to the leaders of the Jewish community. And here is part of what he says to them: “Brothers, though I had done nothing against our people or the customs of our fathers, yet I was delivered as a prisoner from Jerusalem into the hands of the Romans (Acts 28:17 ESV). The Greek term behind our English term customs, ethos, is used twelve times in the Newer Testament. It is the term used for Jewish burial customs in John 19:40, and is used by Luke to apply to Jewish laws in whole or in part. Robert Mounce clarifies things for us: “ethos indicates a formal custom that is usually regulated by some religious tradition, most often the Mosaic tradition.” Paul lived an observant Jewish life in the Pharisaic tradition, which is why, when on trial before the Sanhedrin, we read this of him, “Now when Paul perceived that one part were Sadducees and the other Pharisees, he cried out in the council, ‘Brothers, I am a Pharisee, a son of Pharisees. It is with respect to the hope and the resurrection of the dead that I am on trial.’” He knew that the Sanhedrin was divided into camps, one of which believed in the resurrection (the Pharisees) and the other which did not (the Sadducees). In speaking this way he was reminding the Pharisees, “I am one of you! I believe what you do!” And nobody denied it. Let’s remember please, that this is decades after the inauguration of the New Covenant. If the New Covenant had rendered traditional Jewish life null and void, Paul would have gotten the memo. But the evidence says otherwise. While in his letters to gentiles, he will speak negatively of Torah observance, what he is discrediting is not Torah observance itself, nor traditional Jewish living, but rather he is discediting the false idea that gentiles need to become observant Jews in order to truly be the people of God. This is what he discredits, not Torah itself, which as we know, he calls holy, just, and good (Romans 7). One more incident of Paul’s speech that can easily be missed. Paul knows himself to be a member of the Jewish community. He tells the Corinthians that he was beaten with rods on three occasions, all of this, at the hands of Jewish community leaders, something he endures because being part of the Jewish community is important to him, despite the pain. When he is on trial before the Sanhedrin, we read this little detail. Yes, he testifies to having lived with a good conscience, yes, he calls the Sanhedrin “brothers,” and yes, he submits to their trial as a member of their community. But notice this. After he is struck by command of the high priest, he responds that the high priest had violated Torah by doing so. So Paul is upholding Torah, here, decades after the resurrection. But in addition, when someone rebukes him, saying “Would you revile God’s high priest?” Paul responds , “I did not know, brothers, that he was the high priest, for it is written, ‘You shall not speak evil of a ruler of your people.’” Here he is quoting a passage from Exodus 22:28. Notice! He not only holds himself accountable to the Sanhedrin; he also holds himself accountable to the Torah. Paul clearly did not get the memo that the Torah is defunct with the inauguration of the New Covenant. In Acts 21, Paul comes up to Jerusalem to bring the offering he has been collecting for years among the gentile churches, and to meet with James, Messiah’s brother, the most prominent leader of that generation among Messianic Jews. And what kind of Jewish life was the Jerusalem community living under the leadership of James? Here they are, some fourteen to twenty-one years after Pentecost, and there are thousands upon thousands of Jewish believers in Yeshua there who are all zealous for the Torah. They are still living Jewish lives. If keeping Torah were simply a matter of, “It’s O.K. if that’s your style, but don’t lay your trip on anyone else,” would there have been such universal zeal for the Torah among the multiple thousands of Jewish believers in this central congregation of the entire movement? As this account shows us, they were still participating in Temple rituals, and most important, living like the Jews of the surrounding community. “You see, brother, how many thousands there are among the Jews of those who have believed. They are all zealous for the law, and they have been told about you that you teach all the Jews who are among the Gentiles to forsake Moses, telling them not to circumcise their children or walk according to our customs. (Acts 21:20-21 ESV). “Therefore do this that we tell you. We have four men who are under a vow; take them and purify yourself along with them, and pay their expenses in order that they may shave their heads; and all will know that there is nothing to the things which they have been told about you, but that you yourself also walk orderly, keeping the Law” (Acts 21:23-24, NASB). Some seek to evade the weight of this evidence saying that Paul was simply being accommodating. That is hard to sustain. First, Paul was not an accommodating person. Second, he had gentiles with him on this trip, and for him to behave differently in Jerusalem than he did in Corinth or Galatia would have marked him not as accommodating but as hypocritical. Third, the principal at stake was a big one. 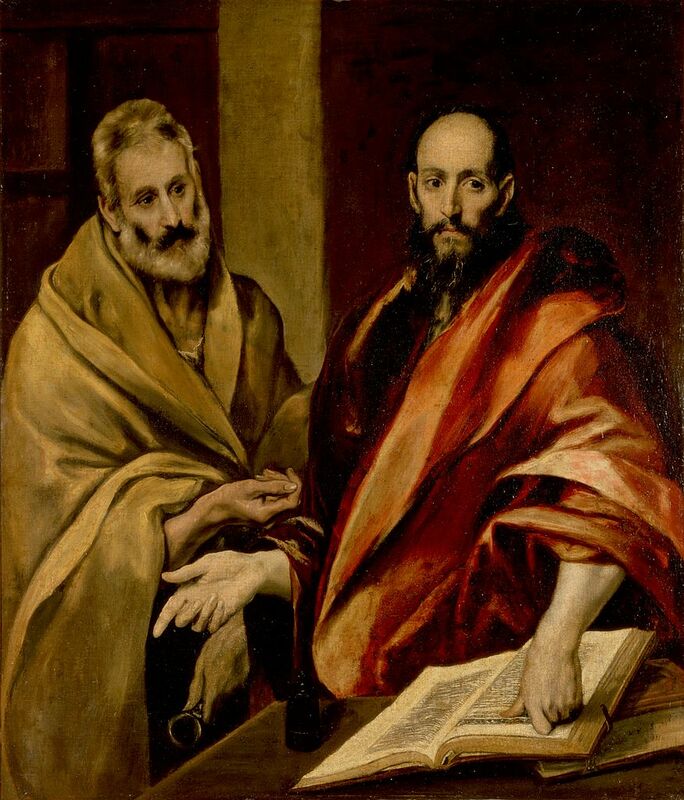 If the common misconstrual of Paul’s teachings were true, that he taught the expiration of the Law, then it makes no sense for him to go up to the Temple to demonstrate that he still obeyed it. Although the idea that the Jewish way of life, as reflected in the observance of the mitzvot of Torah, became obsolete and purely optional after inauguration of the New Covenant, and that the Oral Law is illegitimate may fit the paradigm favored by the good people at TTG, these assertions simply do not fit the facts of the text. At the very least, there are strong arguments refuting their claim, and these are some of them. Last time we took a look at “the more Jewish Jesus,” and this time, “some more Jewish apostles.” Next time we will take a look at one more apostle—James, whose real name was Ya’akov, the Messiah’s brother, and most influential Messianic Jew of his time.